Course Description: This course will explore the evolution of Earth and other worlds across the Solar System and unravel their mysteries using gravitational data. Gravity data revealed by Earth and interplanetary missions have a pivotal role in our understanding of climate change (e.g., GRACE), the structure and interior of planetary bodies (e.g., MESSENGER, GRAIL, MRO, MGS, Dawn), and the history of the Solar System. The course is structured to provide students hands-on experience with gravity data throughout the course and to teach students how to represent, analyze, manipulate, and interpret gravitational data. Another key aspect of this course is to teach students fundamental and cutting-edge methods for data analyses and interpretation, that can be applied to ANY dataset (inside or outside of this field). 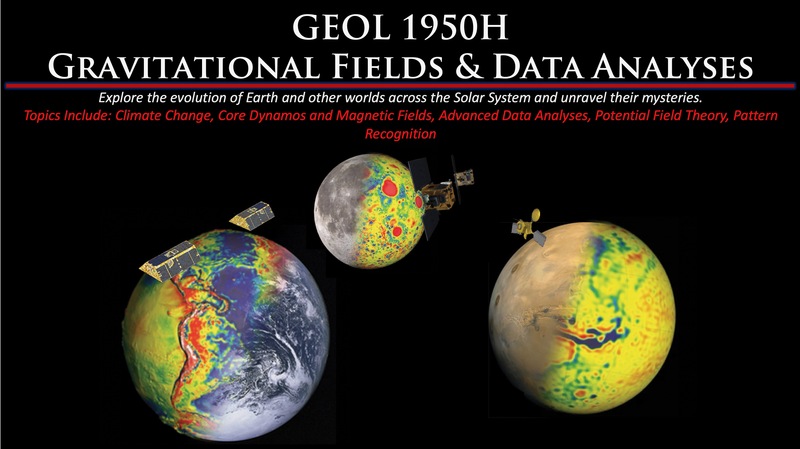 The topics covered in this course provide a foundation for a wide variety of advanced data analysis, representation, and manipulation techniques that extend well beyond Earth and planetary sciences. The course will include topics on potential field theory, geomagnetic data, pattern recognition methods, Monte Carlo methods, and computer modeling techniques. GEOL 0250 or previous programming experience in MATLAB or a high-level programming language (e.g., C, C++, Fortran, etc.). The intended purposes and desired achievements of this course are listed below. Note: Dates, topics, and assignment dates are subject to change. All changes will be announced during class time. Students are responsible for keeping up-to-date on changes to syllabus and coordinating with classmates to obtain any lecture material missed during absences. Over 15 weeks, students will spend an average of 12 hours per week on the class (180 hours total). Two lectures will account for 2.66 hours per week (40 hours), required reading and preparation for class is expected to take approximately 1 hours per week (15 hours), the first two homework assignments are expected to take 15 hours each (45 hours), preparation for each of the two exams is expected to take 10 hours (20 hours). In addition, preparation of the research proposal is estimated to total approximately 60 hours over the course of the term. Workload was estimated using online tool at cte.rice.edu/workload. There is no final examination associated with this course. PROBLEM SETS (30%): There will be three problem sets throughout the semester. Each problem set will cover a different set of the topics discussed throughout the course. For each problem set, students will have been provided an overview of the relevant techniques, models, and an example by which they can verify their homework set answers. Generally, the homework sets will be structured such that students will need to apply the basic concepts and techniques and learned in the classroom. Note: Office hours will be a time where students can get feedback and guidance on homework assignments. Assignments are due at the beginning of class. Late assignments will be reduced in grade by 20% for each day overdue, beginning 5 minutes after class commencement on the due date. No late assignments will be accepted after 3 days past the due date. Students may work and collaborate on their assignments. However, all students must hand in their own work – distinct from and independent of classmates’ work. If you do work collaboratively, you must provide the list of names of the people that you worked with on your assignment. GROUP PRESENTATION (10%): Students will be assigned to a group and will be required to present an overview of a gravitational field for a given planetary body. The presentation will be based on a template provided by the instructor. During this presentation, the group will be expected to (a) compare and contrast with another planetary body as determined by the instructor, (b) determine and present on admittances and surface densities, (c) highlight notable excursions from reference geoid, and (d) discuss features of planetary gravitational field including, but not limited to amplitude range, notable topographic features, and subsurface density anomalies. Each presentation will be limited to 15 minutes with at least 3 minutes allotted for questions. EXAMS (30%): Two exams will be administered throughout the course. Each exam will count as 15% of a student’s final grade. RESEARCH PROPOSAL (30%): Over the duration of the course, each student is expected to develop a six-page research proposal where the primary techniques and methods to execute the research are based on gravity and gravitational analyses. The research topic is to be chosen by the student and may be related, but not duplicative, of ongoing research by the student. The research topic must be approved by the instructor prior to the “topic due date” in the syllabus. The research proposal will be graded based on how well the proposal answers the following questions: (a) Why is the work important? (b) Who will care? and (c) Why are you the one to complete the proposed work? (i.e., does the proposal demonstrate that you are capable of executing the proposed work?). There is no textbook assigned for this course. Pre-class reading assignments noted on the syllabus will be, on average, less than 15 pages each. Readings will be provided by instructor and may consist of excerpts from books, papers, online media, or other materials specifically developed for this course. The instructed is committed to creating and sustaining a learning environment for all students that supports a diversity of thoughts, perspectives, experiences, and identities. Please feel free to communicate to the instructor suggestions on ways to improve the effectiveness of the course for you personally, or for other students or student groups. Your suggestions are encouraged and appreciated. The instructor is committed to full inclusion of all students. Please inform the instructor early in the term if you have a disability or other conditions that might require accommodations or modification of any of these course procedures. You may speak with the instructor after class or during office hours. For more information, please contact Student and Employee Accessibility Services at 401-863-9588 or SEAS@brown.edu. Students in need of short-term academic advice or support can contact one of the deans in the Dean of the College office.